Green House, Good Life: Remodeling Already?! The difference is subtle. 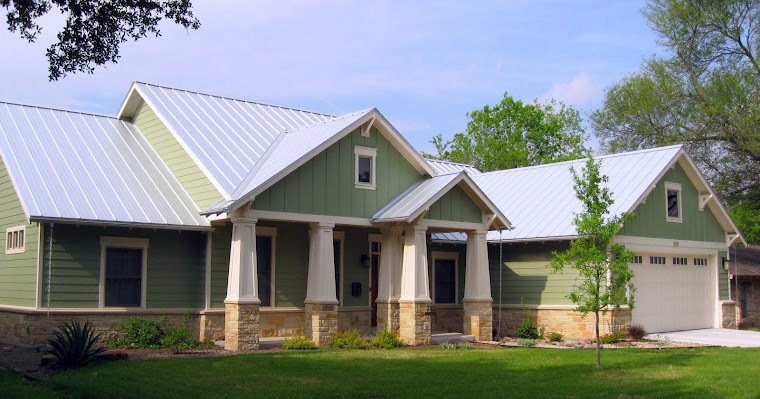 They extended the front gables (the big triangle with the window in the middle and the smaller triangle over the front door) down four inches, putting thicker trim at the bottom, and added a more interesting trim detail at the tops and bottoms of the columns. Plus they recentered the window that was off center after they changed the position of the columns, and they built a box that goes around the porch ceiling, finishing it off. I initially argued with R about the fix, not thinking it was worth the effort (or his money), but now that it's done, I see that I was wrong. 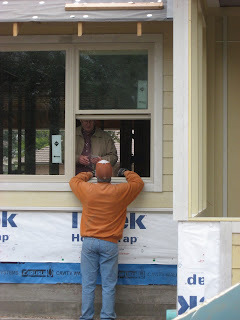 Yesterday they also finished the siding on the outside of the screened porch. The parts without siding, at the corner and in the middle, will have stone "columns." 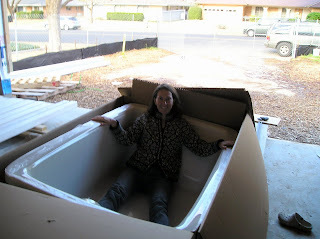 Remember last week when I posted a picture of the really big master bathtub (well, the box it came in)? I wished there had been something or someone in the picture for scale. The next day, I ran into R at the house and asked him to get in the tub so I could take a picture. UM - Phil is totally going to have to take a bath at your house - if not before we leave then on our first trip back!